Let me just start by saying that this tutorial is not for the faint of heart. I have never once given up in the middle of a sewing project, but if I didn't have a ruffle foot, I probably would have thrown in the towel on this one. The actual skills needed to make this aren't very advanced, it just takes a looong time and is very tedious. If you decide to tackle it, just know that you have been forewarned. You will need lightweight cotton fabric in the various shades that you want for the ruffles. I had 6 different color shades. I purchased all of my fabric at the LA Fabric district so I was able to get them in 60" bolts. It was also nice because all of the colors were grouped together so it was easy to see what the transition would look like from white to a dark mustard color. All of the fabric measurements below are based on a 60" fabric bolt. - For your main shower curtain piece you will need about 4 1/2 yards. This will give you enough for the entire back of the curtain (what all the ruffles will be sewn to), as well as 2 rows of ruffles. - For the rest of the ruffles, it just depends on how many ruffles you want to make out of that particular color. I found that about 1 1/2 yards of 60" fabric was enough to make 2 rows of ruffles. You will need 10 ruffles total. note: I prewashed and dried all of my fabric before I made this. That way I can throw it in the wash when it gets dirty and not have to worry about it shrinking. Some light-weight interfacing. You don't need very much of it, about 1/4 of a yard would be enough. A ruffle foot, if you have one. Like I mentioned earlier, this was my saving grace. Manually creating each ruffle will take a lot more time, so just be aware of this. Cut your fabric for each piece of the curtain. - You will need 10 ruffles total. 9 rows need to measure 9 1/2" L x 144" W (this is double the width of the shower curtain to give you a nice full ruffle). The top row of ruffles needs to measure 7 1/2" L x 144" W. I definitely had to piece fabrics together here. Some of my ruffles have 3 different pieces, but the seams are barley visible once everything is ruffled. It really helped to label each piece once everything was cut. 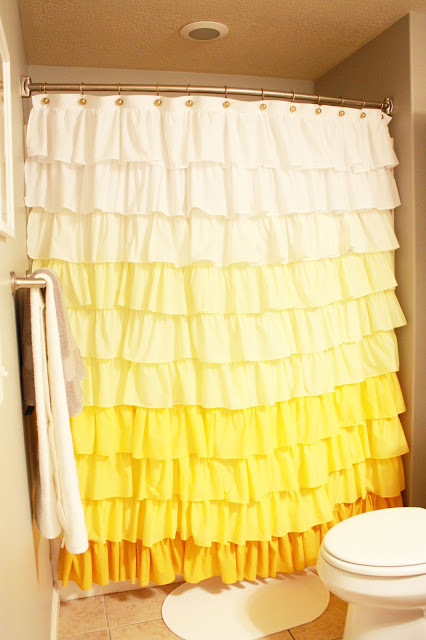 I labeled the main shower curtain body pieces as well as each ruffle in order. Surge / zigzag stitch around every edge of every piece of fabric. I'm talking main curtain, each ruffle, everything. You can take or leave this step, and it is super tedious, but you won't have to worry about your fabric ever fraying. Plus it looks nice and professional. You will be glad you did when you are finished. After putting that much work into a project, you want to make sure it will last you a long time. My serger scraps really piled up by the time I was done. Now you will have a nice LARGE pile of perfectly prepped fabric. Fold down and press the edges of your ruffles, and sides of your main shower curtain body 1/4" (don't worry about the top thin piece to the main body). Sew 1/4" away from edge. note: You don't have to fold under and sew the top of any of your ruffles. These won't be seen. Just the sides and the bottom. Time to get your ruffle on. 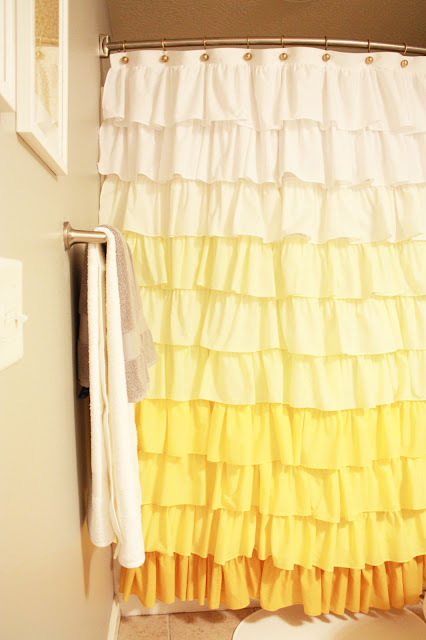 Ruffle your 1st row of ruffles and sew it to the very top of your large main shower curtain body (make sure it is the 7" ruffle and not the 9" ruffle). You can use your ruffle foot or stitch a long basting stitch and pull the end thread to create your ruffle manually. Make sure it is the same width as your main curtain (72"). This is easier said then done. By the end of your 6th ruffle you will be a master at man-handling 144 inches of fabric. Mark with tailors chalk or a highlighter where each row of ruffles will be placed. Your main curtain length is 70" long, you have 10 ruffles, so you will want 7" of each ruffle showing. Having the 1st row of ruffles helps give you an idea of where to start. Mark where your 2nd row of ruffles will be sewn 2" underneath your 1st row (those 2" will be hidden). Then, measure 7" down from that mark for the 3rd row, 7" more for the 4th row etc. Ruffle the remaining 9 strips of fabric till you are ready to gouge your eyeballs out. Make sure each row is 72" wide after being ruffled. Remember to keep each row of ruffles labeled so you know in what order to place them. 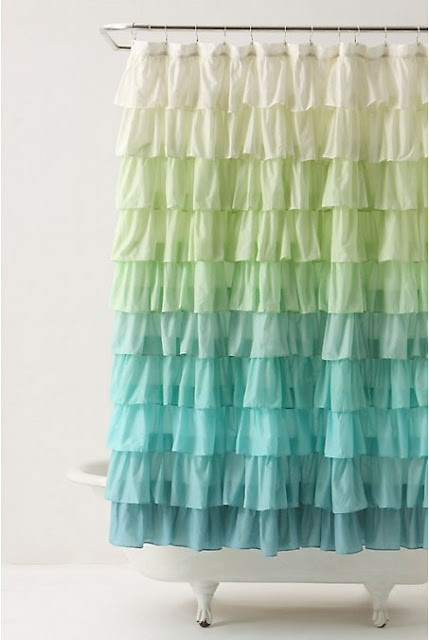 Pin your ruffles to your main curtain along the lines that you have previously marked, and sew in place. I started by pinning about 2 rows at a time, sewing them, then pinning on 2 more rows. The more pins you use, the less chance your ruffles will shift as you are moving your fabric around. note: The more ruffles that are attached, the heavier the fabric gets and the harder it is to control. So go slowly. 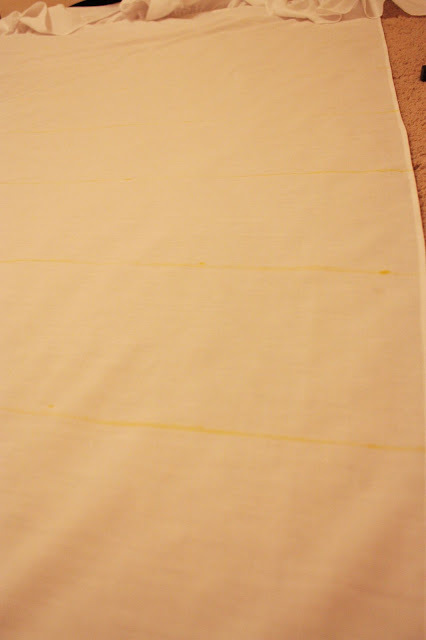 I was constantly checking and double checking that I didn't have extra fabric bunched up under my needle as I sewed. Iron the top piece of your shower curtain in half width-wise, open it up and place the interfacing in the middle. There should be about 1/4" fabric that is not covered by the interfacing. Fold back in half and press long enough to make the interfacing bind to the fabric. The interfacing is to make the fabric more stable since you will be sewing button holes along the top for your shower curtain rings. Finish off the edges of the top of your shower curtain by folding in half wrong sides together, stitching 1/4" away from the edge, flipping right-side out and pressing. Pin the top section of your shower curtain to the main body of the curtain. Right-sides together, with the bottom/raw edges pointing up (see picture). It kinda looks like my sewing machine threw up a bunch of ruffles, doesn't it? Fold the top of the shower curtain with the right side facing you, and press (make sure the selvage edges in the back point down). Sew button holes. Make sure your button hole is large enough to fit your curtain rings through. I suggest practicing on some scraps before you start so that you know exactly where to mark your fabric. You will sew 12 button holes total. The 2 outside holes should be 2" away from each end, then the rest of the button holes should all be 6" apart. Cut open each button hole with your seam ripper. Now go get a massage, and make your husband take you on a hot date. You deserve it. I am in love with the end result. And I only spent $20 on the fabric! Sewing this curtain was a lot like going through a pregnancy. Unbearable during some points, but once the process is completed, you tend to forget how painful the process actually was. I think I might shower in this bathroom from now on.